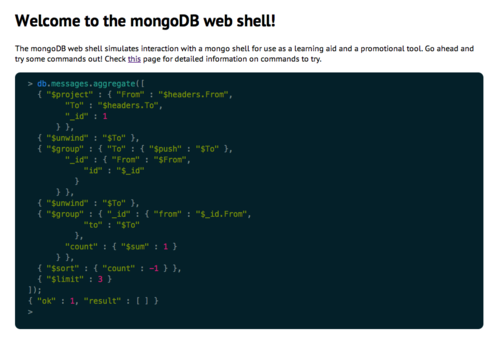 The MongoDB Web Shell is a web application designed to emulate some of the features of the mongo terminal shell. This project has three main uses: try.mongodb.org, 10gen Education online classes, and the MongoDB API documentation. In these three different contexts, users will be able to familiarize themselves with the MongoDB interface and basic commands available both independently and as part of a 10gen education homework assignment in the education program. 1) sandboxing capability to manage sessions and access to resources on the backing database 2) a framework for preloading data into a given resource 3) ability to verify data state for use in the online classes. One of the challenges in developing a fully featured shell was the ability to execute user-written code in a sandboxed environment within the browser. Originally, the shell relied on parsing the code into an abstract syntax tree (AST) and mutating the source to namespace variables in a manner where var x would become mongo.shells[index].vars['x']. We quickly realized that this implementation would be difficult to maintain given potential feature growth and the number of edge case scenarios. Instead, the latest version of the shell delegates the scoping of variables to the browser by executing in an iframe element that intrinsically provides many sandboxing features. The MongoDB Web Shell will also make its debut on the 10gen Education platform where users learn to develop for and administer MongoDB quickly and efficiently. Currently, the assignments for the online classes must be downloaded and solved locally on an individual installation of MongoDB. With the web shell, students will be able to complete and submit assignments entirely within the education platform without needing to download and install their own copy of MongoDB or sample data. This online solution makes it more convenient for users to take courses wherever they may be and makes it easier to validate the correct completion of an assignment. Furthermore, users will no longer be required to load their own datasets using mongorestore since it is handled directly by the shell. Finally, since all the work is stored on their online account, students will be able to continue their work from where they left off from any computer. 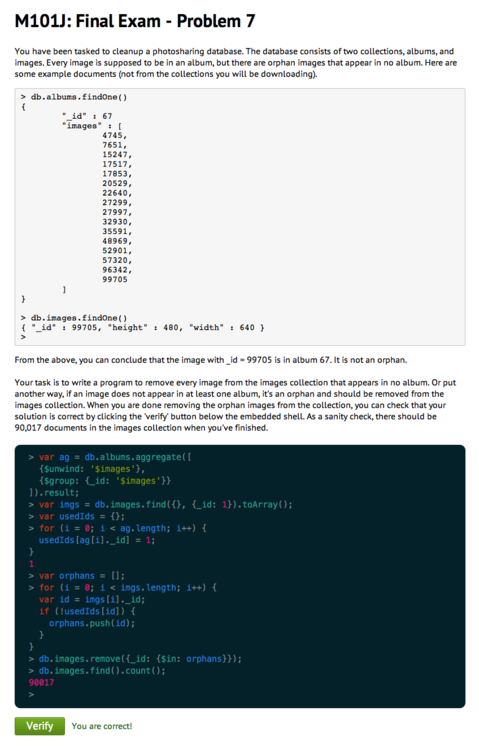 Finally, the MongoDB Web Shell will be embedded into the API reference pages as part of the database’s documentation. This will allow a user to immediately test the commands detailed on the page and to evaluate its effects against provided sample data sets. This project is Apache licensed open source software and is freely available through this Github repository. We have provided documentation using the Github wiki and welcome any feedback or contributions through issues and pull requests. The mentioned suspend.js library can be found at this Github repository. 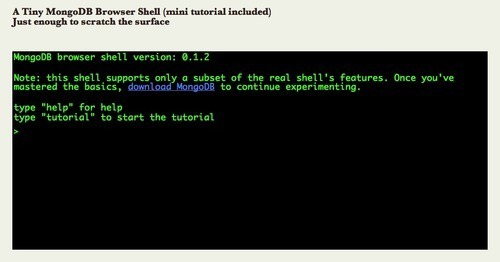 The MongoDB Web Shell driver was developed by Ryan Chan and Danny Weinberg, who are currently interns at 10gen. Special thanks to 10gen for hosting us as interns, Stacy Ferranti and Ian Whalen for managing the internship program, and our mentors Ian Bentley and Emily Stolfo for their help and support throughout the project.